With all of the exciting moves that have already happened this offseason, it is time to turn some attention to the coming season. Even with major stars left on the Free Agent market, such as Max Scherzer and James Shields, we can take a look at some players that do have a home. The following list includes 4 players coming off career best seasons and one coming off yet another very strong season. While each of these players is coming off a strong season, they are all due for significant regression from last year. While it is unlikely that these players would repeat their career best numbers, all of these players are going to see a large drop in production in 2015. However, it does not seem that every Major League team agrees, as three of these players have been traded this offseason, and another landed a 4-year, $68 million contract. The first player on this list is in for the toughest season ahead. Alfredo Simon enjoyed a very successful season in terms of traditional metrics, as he completed his first Major League season as a full-time starting pitcher. 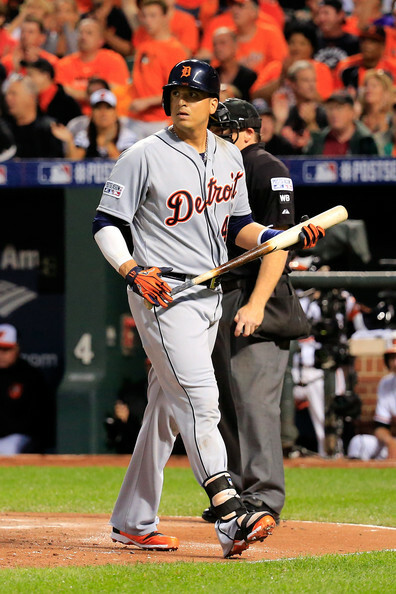 Simon was traded from the Cincinnati Reds to the Detroit Tigers in return for a young Major League shortstop and a 2013 1st round draft choice. The 33-year-old had a 15-10 record with the Reds supported by a 3.44 ERA, however, his peripherals tell a different story. Simon only had a 5.82 K/9, which contributed to his less than appealing FIP of 4.33. His strong ERA likely was not a mirage, but more a result of playing in front of the best defensive team in baseball, as the Reds ranked 1st in Defensive Runs Saved (DRS) with 67 last year. Unfortunately, Simon will now pitch in front of the 28th ranked defense of the Tigers, who totaled negative-67 DRS. The righty will also be moving to the American League, which will be another challenge for him, as he struggled during his 4-year stint with the Orioles before 2012. While he enjoyed a breakout campaign in 2014, Simon will likely finish this season with much worse numbers, as he will be pitching in front of a significantly lesser defense and in a much tougher league. The second player on this list is another Former Cincinnati Reds pitcher, who was just traded. Now a member of the Marlins, Latos contributed another successful season for the Reds in 2014, as he posted a 3.25 ERA over 102 1/3 innings while he battled numerous injuries. However, those injuries are a major cause for concern moving forward, especially because they had such a powerful impact on his velocity. His velocity also did not improve after he returned from his injuries, suggesting this could be a lasting result. Latos lost over 2 mph off his fastball from 2013, and while his ERA remained strong, his strikeout rate dropped to a career worst 6.51 K/9. His groundball rate also dropped nearly 8% from 2013, which is not a positive sign for a pitcher who struggles to strike batters out. Just like Simon, Latos is going to a worse defensive team, as the Marlins ranked 18th in DRS last season, which could hurt Latos quite a bit, especially if his strikeout rate remains below his career norms of around 8 K/9. Despite his consistent performance in the past, Latos will likely turn in a very disappointing season in 2015. Dee Gordon broke out in a pretty big way for the Dodgers in 2014, as he posted a 3.1 fWAR while slashing .289/.326/.378 (Avg/Obp/Slg). However, prior to 2014, Gordon had a negative-0.9 fWAR. His entire game is predicated around his speed, as he is not a strong defender and has no power to speak of. 2014 was Gordon’s first season with an above average wRC+ and he still only reached 101, which is just 1% better than league average. However, what makes 2014 seem like an aberration rather than Gordon’s new normal, is that it was powered entire by his .346 BABIP. It is easy to believe that his speed is the reason for his inflated BABIP, but in his two previous seasons Gordon posted BABIPs of .281 and .292 respectively. Gordon’s already low walk rate also got even lower last year, which will be a more significant issue when his BABIP normalizes and needs other ways to reach base and utilize his only real weapon, his speed. If the Marlins are expecting a repeat performance from Gordon, (which they likely are because they gave up their top prospect in Andrew Heaney) then they are going to be very disappointed. Unlike the above players, Martinez has not changed teams this offseason, thanks to the Tigers resigning him with a hefty $68 Million to play the next 4 years with them. What was so shocking about Martinez’s career season was that it came when he was 35 years old. He has always been a productive hitter, but in 2014, the DH turned into a real force in the middle of the lineup. In the past, he was more of an OBP machine with extra-base power, but he never reached 30 homers and hadn’t reached 20 since 2010. Martinez’s power made an appearance in 2014, however, as he mashed a career-high 32 homers, while improving in just about every other offensive statistic. More than just his age, it is unrealistic to expect Martinez’s newfound power to carry over into 2015, as he was helped by a career-best 16% HR/FB rate, which was more than his last two seasons combined. Martinez will still be a productive hitter in 2015, but he will not be the homerun threat he was in 2014, which makes him more of the average DH he was in 2011 when he accumulated 2.5 WAR. The 31-year-old Pearce was one of the great stories of 2014, as he enjoyed an unexpected breakout from being nothing more than a bench player for the earlier parts of his career. And unlike most of the other players on this list, Pearce has not changed teams or landed a new big contract. Pearce posted a 4.9 fWAR after accumulating just 0.2 fWAR over his first 5 Major League seasons. Throughout his Minor League career, Pearce always posted strong On-Base numbers and has had strong walk rates in his Major League career, as well. However, his power in the Minor Leagues never translated to the Majors until 2014, when he slugged .556 and reached 21 homers in just over 100 games. However, Pearce’s power spike was largely aided by a HR/FB rate of 17.5%, which is more than his two previous seasons combined. He is not likely to regress too far from that rate, however, as he has made some mechanical adjustments that made him a much more impactful hitter against fastballs. After such an impressive breakout campaign, the league is likely to adjust to Pearce’s approach, which mainly involved mashing fastballs, especially those up in the zone. Pearce could be the next Jose Bautista, but it is more likely that this is an outlier season and he is now likely to turn in just league average or slightly better seasons. Once the league adjusts and his HR/FB rate normalizes, he will not be as much of a threat in the box, but he is still likely to remain productive at reaching base. Mat Latos is likely in for the most significant drop from his expected performance, but he should still be able to be a league average starter, if healthy. Alfredo Simon will likely be the least productive of any of the players on the list, especially since he had less than inspiring peripherals in a more pitcher-friendly league. Of the above players, Steve Pearce is the most likely to match or come close to his 2014 performance. This entry was posted in Uncategorized and tagged Alfredo Simon, Dee Gordon, Mat Latos, Steve Pearce, Victor Martinez by baseballstooges. Bookmark the permalink.